Furniture made out of bicycles. Hmm. Many of the examples I've seen look like they fit in well on the porch of a hippie collective - perfect to relax in while surveying your organic beet root fields while scratching your scruffy beard. With your husband by your side. With a sigh of relief I read today about a chap named Mads Hvidkjær Binderup who just completed his graduation project from the Architect School in Aarhus - Denmark's second city. 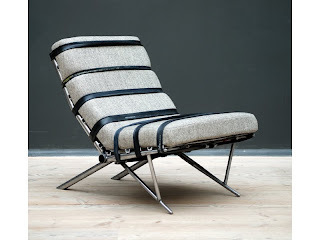 He decided to create a couple of chairs using discarded bicycles. He read one day that 40-50 bicycles are fished out of the Aarhus River each week. This fact triggered him to embark on designing the chairs "Re-cycle One + Two - a cultural and societal comment" for his grad project. Bindrup was keen to design something under the 'Discarded. Recovered. Re-purposed' banner, making a cultural statement about our 'disposable, consumer mentality' and our eagerness to just throw things away. 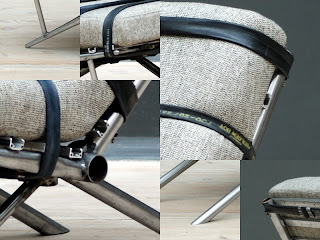 He recieved 16 muddy and rusty bicycles from the city and spent six months designing the chairs. He used four identical - or almost identical - frames for each chair and by coincedence the frames are from the Danish Centurion brand - one of the major bicycle brands you see on the streets here in Denmark. "You can't see right away that bicycle frames were used, but if you look carefully you recognise all the parts", says Binderup. That's what I like about the chairs. 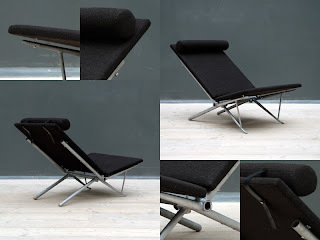 Subtle, elegant and following in the long tradition of Danish design. 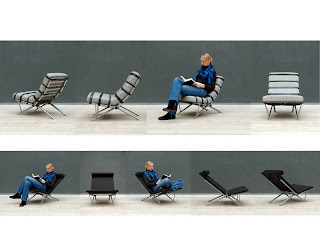 Bindrrup doubts that the chairs will make it to mass-production due to the fact that so many man-hours are required in making them. But he is pleased to have been able to make a statement about the environment. Via: 'House' & Arkitektskolen Aarhus.